I remain stunned how often I still read announcements from large off-line travel agents (in Australia, Asia and elsewhere) saying that they don't need to worry about competition from online players. Just recently in separate reports leaders of two of the largest in the Pacific region reaffirmed their online travel disinterest. Graham Turner (Lacaze's rival over at Flight Centre) continued the "denier" talk during the presentation of his FY09 annual results (see TravelToday pdf here). Telling the audience and media how little he was worried about online travel companies and that they were not a threat to his business. Embrace Technology: Accept the fact that technology is critical to selling travel well. Hire a team of developers (or do a deal with a technology company) devoted to online only activities, reporting to the new online boss. 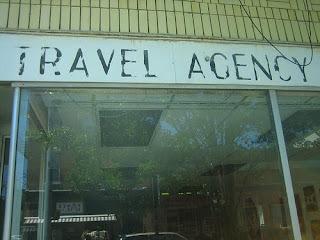 Rewrite store experience (copy the supermarkets): The travel agency store layout has not changed in my lifetime. The rows of brochures in no particular order with deal led window displays look the same today as they did in the 70s, 80s and 90s. Meanwhile other retail organisations (especially supermarkets) have invested heavily in consumer retail pattern research and store layout. The location of items, stores and promotional spaces has become a science. All designed towards bringing the customer to the store, keeping them inside the store and directing their purchasing behaviour. Travel companies have to do the same. They need to rewrite the consumer experience to make more of the merchandising opportunities offered by access to customers walking around with their wallets in the pockets. my ears tend to prick up when i hear absolute type comments such as “not in my lifetime”. like the organiser referring to the A1 GP on the Gold Coast who said "the cars are coming 120%" and two days later they cancelled. Or when Ansett was running their close to death ads using the song "absolutely". tells me the person making the comment is perhaps hiding something, or as you point out, in "denial", whether consciously or not. somehow i think for an off-line player to focus online, they need to setup seperate brands and management teams, that can leverage from the off-line brands buying power. can't think of a good example of this? closest is maybe eBookers, founded by Dinesh Dhamija. @Steve - great comments as always. I think it is now too late to set up new brands - particularly in smaller markets like Australia, New Z and Sth Africa. the cost of building the new brand would be too high. And..I dont think the companies have the people that would know how to do it. This late in the game I think the only option is to bet that the online cannibalisation will make up for the offline declines, especially if the second set of three recommendations are implemented. BTW - just finished a great holiday in Port Douglas including a seamless experience booking a hertz car via Oodles! Tim I had the experience years ago with Thomas Cook as a shareholder how we where blocked from deploying an air booking engine out of fear that franchisees would see the franchisor as competing. If an offline business is a bricks and mortar franchise organisation I believe it is unrealistic to think they will or even can change into an online business. They will have to go down with the sunset. No smart .com exec can save them unfortunately. Re brands it is interesting that today in SA hardly anybody remembers Thomas Cook, and brands that did not exist in those days are household names. I am thinking about online accommodation portal brands here like SA-Venues.com and Wheretostay.co.za, sleeping-out.co.za etc. In the same way airline brands like Mango and Onetime never existed but today are far more visible than SAA or BA. I think one thing that online has done is it has facilitated the rapid creation of new brands. i agree that they've missed the boat to split off a brand using standard ota model. they'd probably need to come up with some innovation but doubt they have it in them. yeah which leave them with the offsetting decline option you point to. great article. thanks for the wonderful ideas. Guys if they go online they screw there franchise owners and then it opens a new internal battle. I think that one of the key trends in online travel right now is personalization - find what you need quickly without browsing across hundreds of pages. But traditional travel agents already have a huge advantage here - they have deep domain knowledge and direct consumer access. So, if they invest in technology to create an online presence and serve customers faster, they will have a market for a while. @Anon - the comment about the internal battle with franchisees is a fare comment. However to avoid or reduce your commitment online to protect the franchisee network is ultimately doomed. Better to use the second set of recommendations to prove your commitment to off-line and as the means for compensating the franchisees for the business they will lose when sales go online. @Michael - re: personalisation. I agree that agents have an advantage as they can "read" the behaviour of the person in front of them or on the phone. But without a technological investment in data collection and profiling so much will be missed.